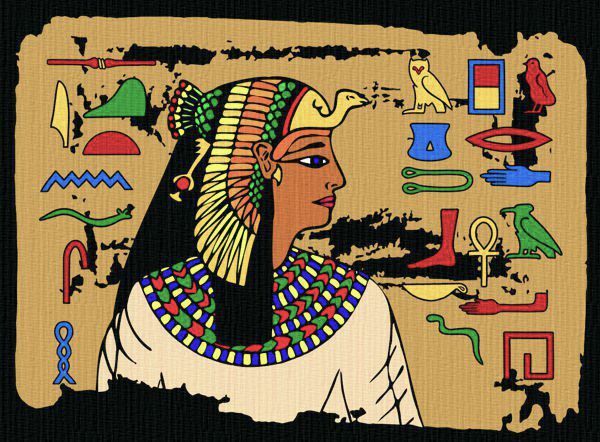 Our Ancient Egyptian head is based upon a painting of Queen Nefertari from her tomb in the Valley of the Queens. 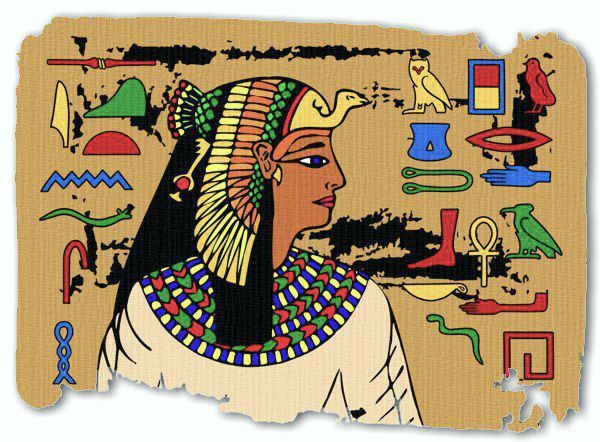 Queen Nefertari is usually shown wearing the Royal Vulture Crown of the goddess Nekhbet, the protector of Upper Egypt. 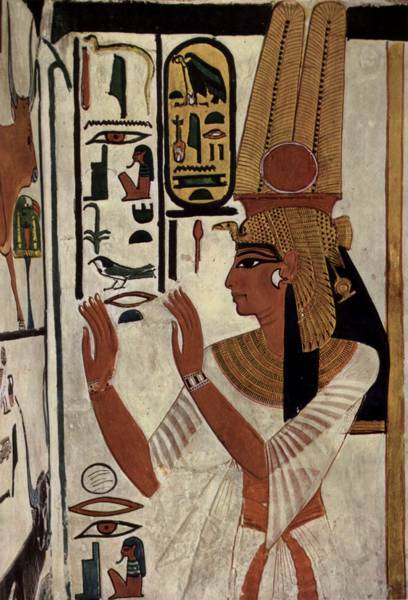 Nefertari was the favourite wife of the greatest of all the pharaohs, Rameses II, and she bore him at least six children. She probably died after his 30th year on the throne, about 12 centuries before the birth of Christ. TECHNIQUE: The artistic process used to create the time-worn effect of this portrait is a mixed media technique called Paper Batik. In this lesson we will guide you through this technique from the initial drawing to the completed portrait explaining each step of the process as we go. 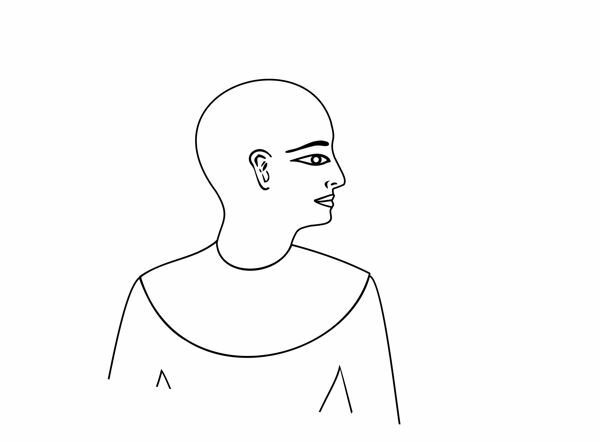 A traditional Egyptian image shows the head and lower body viewed from the side, with the eye and upper body viewed from the front. At first look, the figures drawn by the Ancient Egyptians may seem wooden and flat, demonstrating a limited understanding of the human form. However, you need only look at their sculptures to realize that this is not the case. Their drawings are simplified and stylized images which represent the eternal spirit of the character that they depict, and as such, are quite sophisticated images. In our drawing above we have focused on the upper half of the body. The image was drawn in line without any shading using a charcoal pencil on a heavy-grade white paper. In the second stage of this drawing we have added a headdress, a pectoral decoration and a tunic. Any solid black areas, such as the hair are shaded in with charcoal. Do not worry if the charcoal becomes smudged as this can add to the texture of the work in its later stages. The headdress worn here is a version of the Royal Vulture Crown. Pectoral decorations are large ornamental necklaces which are worn over the chest. These necklaces often supported a large piece of jewellery like the one in the design above which is copied from a pectoral jewel discovered in the tomb of Tutankhamun. 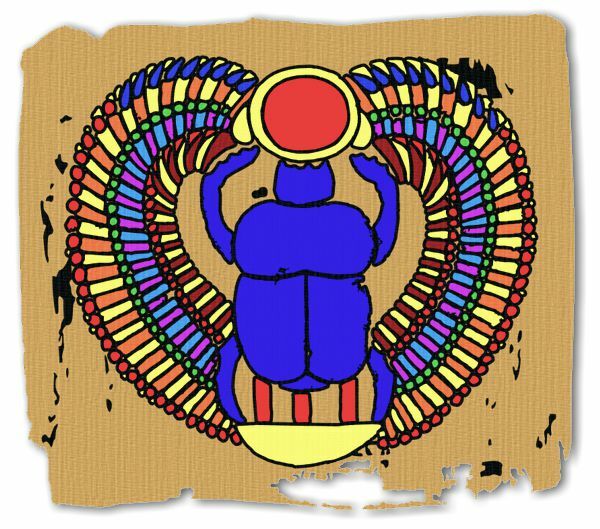 Its design is based on the hieroglyphs from his personal cartouche. 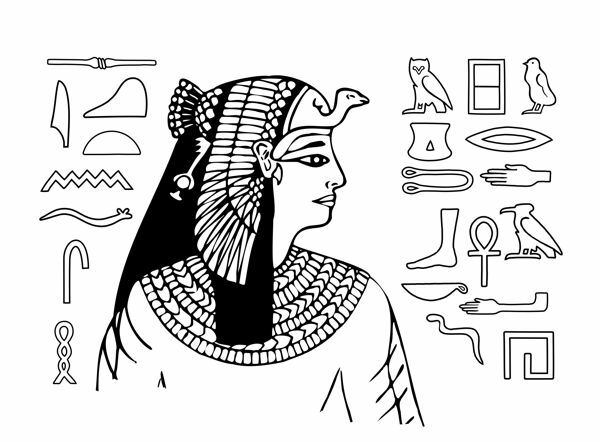 At this stage you can decorate the background with an arrangement of hieroglyphics. The hieroglyphs in our drawing have all been taken from our Hieroglyphic Alphabet pages. 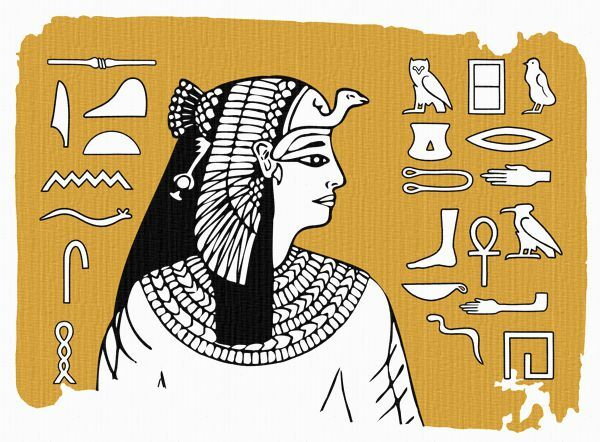 Try to arrange your hieroglyphs to create an interesting composition. In our drawing, they have been composed around the figure into a rectangular form that echoes the shape of the paper. NOTE: You will find information on the best materials to use at the foot of this page. You are now ready to start the painting of our portrait. We have used yellow ochre for the background as this sandy color is often associated with Ancient Egyptian images. The paint was mixed quite thickly with a little water to about the consistency of double-cream and applied neatly around the head and hieroglyphs. The borders are deliberately painted more loosely to simulate the edge of an aging piece of papyrus or a decaying mural. 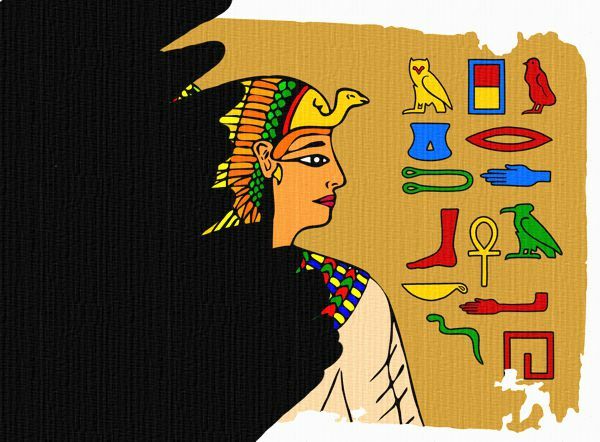 To complete the painting, carefully fill in the details of the figure and hieroglyphs using a range of appropriate colors. 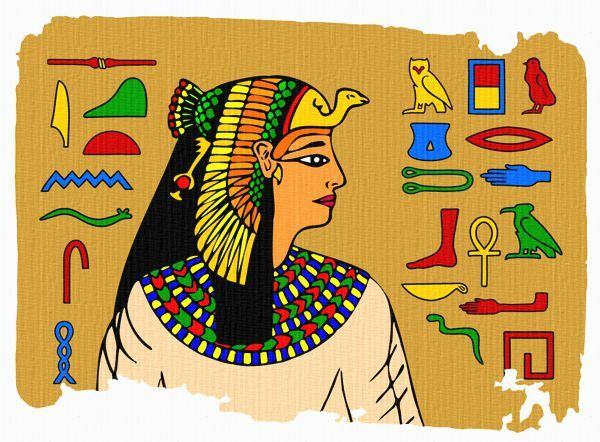 Strong primary colors (red, yellow and blue) and secondary colors (green, orange and purple), in combination with black and white, were often used in Ancient Egyptian painting. Note how the rough edge of painting has been continued through the color of the tunic. Please note that any areas that you wish to remain white, such as the whites of the eyes, must be painted with white paint. It is very easy to miss these when you are working on white paper. Do not worry if you sometimes paint over a section of black line. It will not ruin the overall effect. NOTE: Let all the paint dry thoroughly before you start the next stage. Using black Indian ink, paint over the entire picture. The aim is to lay a skin of Indian ink on top of the painted image. Next, leave it for several hours until it is completely dry. 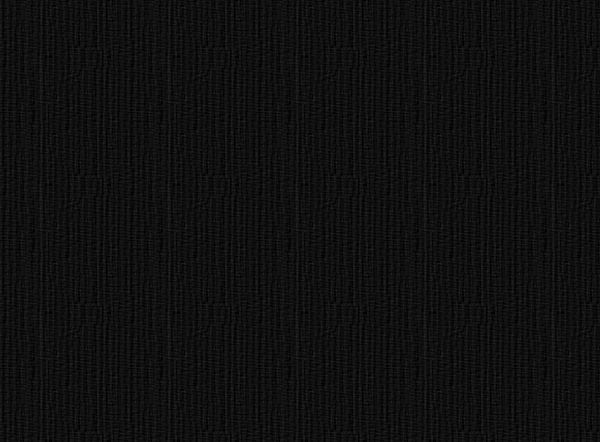 Do not worry when your image disappears under the black ink. It will reappear during the next stage. NOTE: Try to cover you picture in a single coat. Use soft, even brushstrokes to liberally apply the ink. Continued brushing over one area will start to dissolve the paint underneath and, once dry, you will find it impossible to remove the ink from that area. Once your picture is completely covered with Indian ink, leave it aside to dry, at least for several hours but preferably until the next day. When you are sure that your paper is bone dry, hold the picture at opposite corners and carefully run it under a hot water tap. The Indian ink will begin to flake off and some of the thicker paint will wash away. The colors will pale slightly and some patches of ink will remain stuck to the painting. Lay the finished picture on a flat surface and absorb any excess water with paper towels. Then leave it to dry. The final effect will reveal the ageing texture of an Ancient Egyptian parchment or wall painting. This is the type of final image that should appear at the end of the Paper Batik process. All the areas where the charcoal drawing was exposed or any unpainted patches should have absorbed the ink. The painted areas should look more translucent and weathered. Sometimes all the Indian ink does not wash off but this is not a problem. Patches of dark may remain where the paint has been too thinly applied. However, these patches often add to the perished and ageing effect of the image. As an alternative method of finishing the work, you could increase the time worn effect of the image by cutting it out from its dark border to simulate the natural disintegration of an ancient parchment. 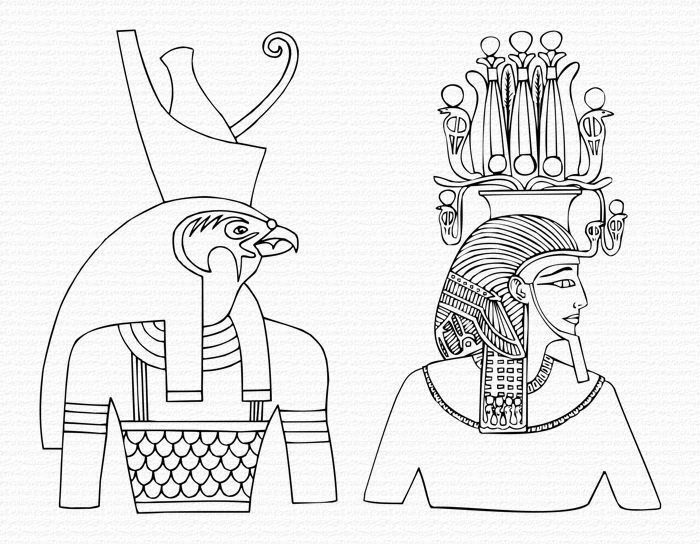 Click on the link or the sketch above to download a free .pdf document with A4 line illustrations of Egyptian Gods and Crowns. 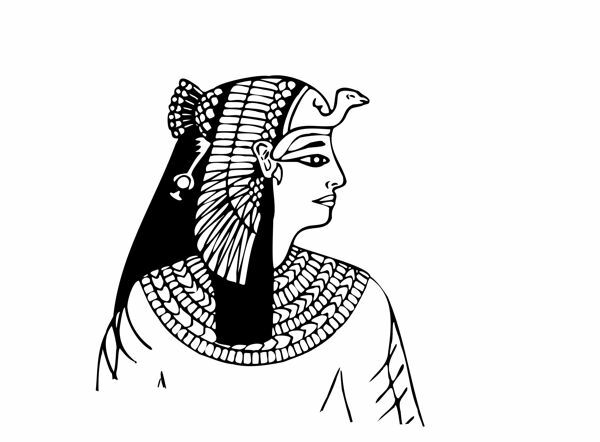 You may print and use these to help with your drawing in our Ancient Egyptian Art Lessons. 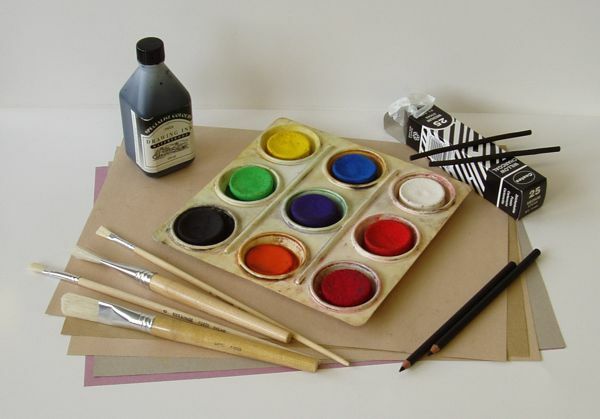 The art materials you will need to produce a paper batik are a charcoal pencil or stick, a heavy grade paper, a paintbrush with tempera blocks (the cheap paint discs you get in schools) and a bottle of waterproof Indian ink. As a result of experimenting with various water based paints, we have discovered that tempera blocks produce consistently good results with this technique. Tubes of tempera paste and other water based paints have produced inconsistent results and acrylics do not work at all.